Winter’s Coming is a beautifully illustrated non-fiction picture book that introduces primary aged children to various animal adaptations to winter. The award-winning author, Jan Thornhill, tells the story of a young snowshoe hare as she observes the changes in her forest home as winter approaches. She worries about what she should be doing to prepare for winter until a bear explains that she is ready—her fur has thickened up and turned white! A number of animal and environmental facts are included in a section at the back of the book. 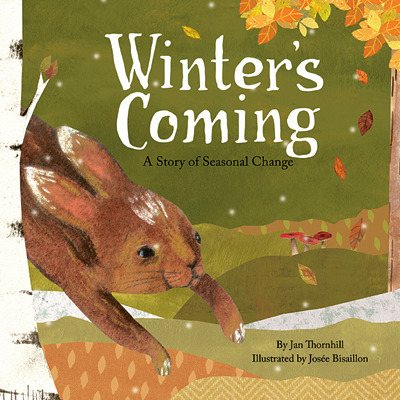 Classroom Connections: Used as a “read aloud” book, Winter’s Coming provides many opportunities for the teacher to ask primary students to make connections, ask questions and to make predictions. This title also has strong links to the primary science curriculum and could serve as an introduction to the use of the calendar, to learn about seasonal changes and to provide a springboard to a variety of animal studies and writing projects. Josee Bisaillon’s illustrations are an engaging mixture of drawing and collage work that could be used as inspiration for any number of art and craft projects that young students would love. This review is from Canadian Teacher Magazine’s Apr/May 2015 issue.